At the peak of his creative powers, the 29-year-old Bernardo Bertolucci eschewed the influence of mentor Jean-Luc Godard and partnered up with Vittorio Storaro and developed his own style for one of the most visually dazzling, politically and psychologically intriguing of all Italian films in the shape of the 1970 The Conformist (Il conformista). Told in a non-linear structure that would go on to influence The Godfather Part II (one of a number of influences on Coppola's film), the story begins in Rome, 1938. Marcello (Jean-Louis Trintignant) is a young fascist who takes on the job of assassinating his former professor who has fled to Paris. With his wife (Stefania Sandrelli) in tow, he meets the professor and his young wife (Dominique Sanda), with whom he begins to fall in love. A thriller as well as study of Italian politics and psychological character, Bertolucci's Oscar-nominated adaptation of Alberto Moravia's novel (an adaptation Moravia greatly admired) has gone on to influence filmmakers such as Paul Schrader, Martin Scorsese and Michael Mann and remains one of the great triumphs of world cinema. 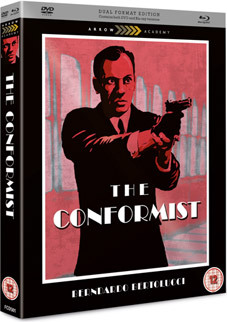 The Conformist makes its UK DVD and Blu-ray debut on 27th February as a dual format release on the Arrow Academy label at the RRP of £27.99. A comprehensive booklet featuring brand new writing on the film by critic Michael Atkinson, a re-printed interview with Bernardo Bertolucci from 1971 and Bertolucci's thoughts on filmmaking, illustrated with original stills.